CERT volunteers practice a victim carry. which is coordinated Nationwide under FEMA. The CERT course will benefit any citizen who takes it. This individual will be better prepared to respond to and cope with the aftermath of a disaster. Additionally, if a community wants to supplement its response capability after a disaster, civilians can be recruited and trained as neighborhood, business, and government teams that, in essence, will be auxiliary responders. These groups can provide immediate assistance to victims in their area, organize spontaneous volunteers who have not had the training, and collect disaster intelligence that will assist professional responders with prioritization and allocation of resources following a disaster. Since 1993 when this training was made available nationally by FEMA, communities in 28 States and Puerto Rico have conducted CERT training. 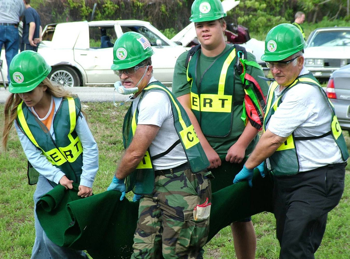 CERT is a proud partner of Citizen Corps and the effort to have everyone in America prepare, train, and volunteer.